Bangi, November 20 2014 – The 2014/2015 campus elections for The National University of Malaysia (UKM) students’ representative went off smoothly without any hitches today. It began with nominations on 17 Nov ending today with voting and the announcement of the results by Deputy Vice-Chancellor (Student and Alumni Affairs) Prof Datin Noor Aziah binti Mohd Awal. The Coalition of UKM Students (GMUKM) won 15 seats with the Pro-Aspirasi group getting 14 seats with one place won by an independent candidate. GMUKM retained their majority but with a mere one seat against last year when they won 22 seats, a loss of seven seats. 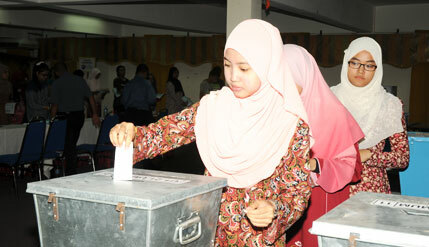 A total of 75.24 percent of students came out to vote in the elections. Three candidates representing the Faculties of Islamic Studies, Pharmacy and Dentistry were elected unopposed.